May be fatal if swallowed and enters airways. Causes skin irritation. H336 May cause drowsiness or dizziness. Suspected of causing genetic defects. Suspected of damaging fertility or the unborn child. May cause damage to organs (Gastro-intestinal system, Liver, Immune) through prolonged or repeated exposure. May cause damage to organs (Kidney, Bone) through prolonged or repeated exposure if swallowed. Very toxic to aquatic life with long lasting effects. Obtain special instructions before use. Do not handle until all safety precautions have been read and understood. Use explosion-proof electrical/ ventilating/ lighting/ equipment. Do not breathe dust/ fume/ gas/ mist/ vapors/ spray. Wash skin thoroughly after handling. Do not eat, drink or smoke when using this product. Use only outdoors or in a well-ventilated area. Avoid release to the environment. Wear protective gloves/ protective clothing/ eye protection/ face protection. IF SWALLOWED: Call a POISON CENTER or doctor/ physician if you feel unwell. IF ON SKIN (or hair): Take off immediately all contaminated clothing. Rinse skin with water/shower. POISON CENTER or doctor/ physician if you feel unwell. IF exposed or concerned: Get medical advice/ attention. If skin irritation occurs: Get medical advice/ attention. Take off contaminated clothing and wash before reuse. In case of fire: Use dry sand, dry chemical or alcohol-resistant foam to extinguish. Store in a well-ventilated place. Keep cool. Dispose of contents/ container to an approved waste disposal plant. Wear self-contained respirator if necessary. Wear protective gloves. temperature or in refrigerator (10-20 ºC) under dark conditions. 1. Keep container tightly sealed. Store at room temperature or in refrigerator (10-20 ºC) under dark conditions. 0.01 (ppm) Consult local authorities for acceptable exposure limits. The usual precautionary measures for handling chemicals should be followed. Keep away from foodstuffs, beverages, and feed. Remove all soiled and contaminated clothing immediately. Wash hands before breaks and at the end of work. Impervious gloves - check gloves using UV light after use to determine level of contamination. Melting point/range: ~400°C to bulk melting point of CdSe crystals. The solvent is liquid and melting point depends on the chemical composition of the solvent. Decomposition temperature: No data available. Danger of explosion: Dependent upon solvent used. Crystalline powder does not present an explosion hazard. No data available., but temperature increases will affect the solvent used. Be aware of the necessary warnings for the specific solvent used. Skin: Irritant to skin and mucous membranes. Probable human carcinogen, limited evidence of carcinogenicity from epidemiologic studies. Carcinogenic to humans: sufficient evidence of carcinogenicity. Reasonably anticipated to be a carcinogen: limited evidence from studies in humans or sufficient evidence from studies in experimental animals. Carcinogen as defined by OSHA. Suspected human carcinogen: Agent is carcinogenic in experimental animals at dose levels, by route(s) of administration, at site(s), of histologic type(s), or by mechanism(s) considered relevant to worker exposure. Available epidemiologic studies are conflicting or insufficient to confirm an increased risk of cancer in exposed humans. Damage to fetus possible Suspected human reproductive toxicant. Reproductive toxicity - Rat - Inhalation Paternal Effects: Spermatogenesis (including genetic material, sperm morphology, motility, and count). Experiments have shown reproductive toxicity effects in male and female laboratory animals. WARNING: Many of the toxic effects of CdSe nanocrystals are still being researched and are currently unknown at this point. Use at own risk. Consult local or national regulations for proper disposal. No chemicals in this material are subject to the reporting requirements of SARA\Title III, Section 302. This product contains a chemical known to the State of California to cause cancer. 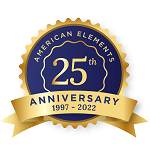 American Elements specializes in supplying seamless Cadmium Selenide Tubing with a variety of dimensions including round, rectangular, square, and oval in numerous standard diameters from 0.02 to 6.0 inches and wall thicknesses from 0.003 to 0.500 inches. Tubing can be further processed to produce rings, washers, sleeves and sheaths. Custom configurations are also available. Materials include most metals including the rare earth metals and other advanced materials. Tubes can also be produced from custom alloys for commercial and research applications and for new proprietary technologies. Other available shapes include bar or plate form, as well as custom machined shapes and through other processes such as nanoparticles and in the form of solutions and organometallics. American Elements produces to many standard grades when applicable, including Mil Spec (military grade); ACS, Reagent and Technical Grade; Food, Agricultural and Pharmaceutical Grade; Optical Grade, USP and EP/BP (European Pharmacopoeia/British Pharmacopoeia) and follows applicable ASTM testing standards. Typical and custom packaging is available. We also produce Cadmium as rod, pellets, powder, pieces, granules, ingot, wire, and in compound forms, such as oxide. Other shapes are available by request. See more Cadmium products. Cadmium (atomic symbol: Cd, atomic number: 48) is a Block D, Group 12, Period 5 element with an atomic weight of 112.411. The number of electrons in each of Cadmium's shells is 2, 8, 18, 18, 2 and its electron configuration is [Kr] 4d10 5s2. 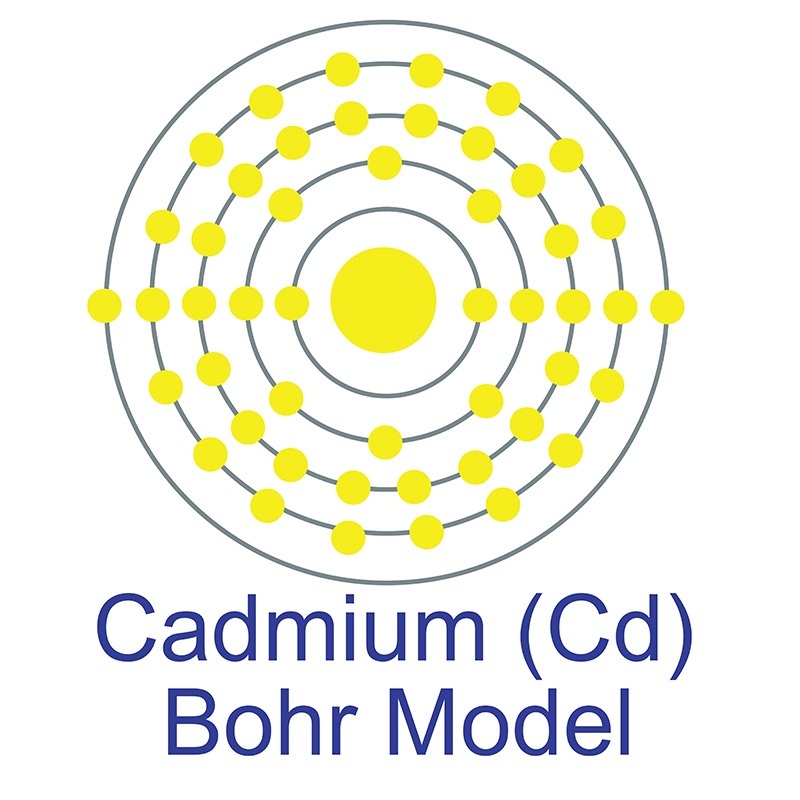 The cadmium atom has a radius of 151 pm and a Van der Waals radius of 230 pm.Cadmium was discovered and first isolated by Karl Samuel Leberecht Hermann and Friedrich Stromeyer in 1817. In its elemental form, cadmium has a silvery bluish gray metallic appearance. Cadmium makes up about 0.1 ppm of the earth's crust. No significant deposits of cadmium containing ores are known, however, it is sometimes found in its metallic form. It is a common impurity in zinc ores and is isolated during the production of zinc. Cadmium is a key component in battery production and particular pigments and coatings due to its distinct yellow color. Cadmium oxide is used in phosphors for television picture tubes. The name Cadmium originates from the Latin word 'cadmia' and the Greek word 'kadmeia'. See more Selenium products. Selenium (atomic symbol: Se, atomic number: 34) is a Block P, Group 16, Period 4 element with an atomic radius of 78.96. The number of electrons in each of Selenium's shells is 2, 8, 18, 6 and its electron configuration is [Ar] 3d10 4s2 4p4. 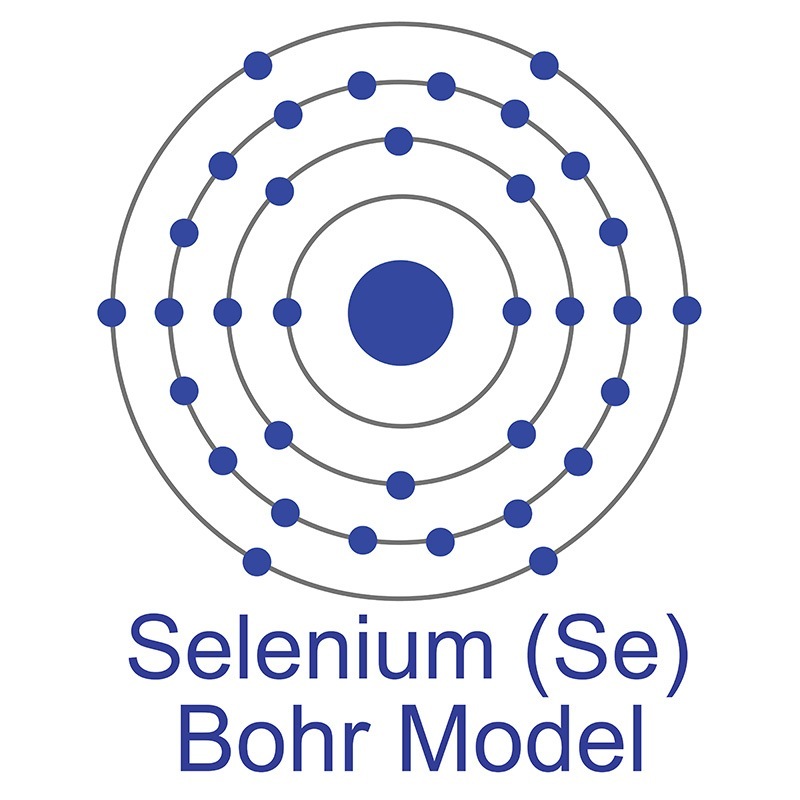 The selenium atom has a radius of 120 pm and a Van der Waals radius of 190 pm. Selenium is a non-metal with several allotropes: a black, vitreous form with an irregular crystal structure three red-colored forms with monoclinic crystal structures and a gray form with a hexagonal crystal structure, the most stable and dense form of the element. One of the mose common uses for selenium is in glass production the red tint that it lends to glass neutralizes green or yellow tints from impurities in the glass materials. Selenium was discovered and first isolated by Jöns Jakob Berzelius and Johann Gottlieb Gahn in 1817. The origin of the name Selenium comes from the Greek word "Selênê," meaning moon. Control of the optical properties of cadmium selenide nanoparticles using magadiite. Heterogeneous sonocatalytic degradation of anazolene sodium by synthesized dysprosium doped CdSe nanostructures. Antiproliferative effects on human lung cell lines A549 activity of cadmium selenide nanoparticles extracted from cytotoxic effects: Investigation of bio-electronic application. Temperature-dependent optoelectronic properties of quasi-2D colloidal cadmium selenide nanoplatelets. Optimization of conditions for cadmium selenide quantum dot biosynthesis in Saccharomyces cerevisiae. Transition from Molecular Vibrations to Phonons in Atomically Precise Cadmium Selenide Quantum Dots. Size-Dependent Lattice Dynamics of Atomically Precise Cadmium Selenide Quantum Dots. The deposition of cadmium selenide and cadmium phosphide thin films from cadmium thioselenoimidodiphosphinate by AACVD and the formation of an aromatic species. Copper selenide (CuSe and CuSe) thin films: electrochemical deposition and electrocatalytic application in quantum dot-sensitized solar cells. In situ grown nickel selenide on graphene nanohybrid electrodes for high energy density asymmetric supercapacitors.